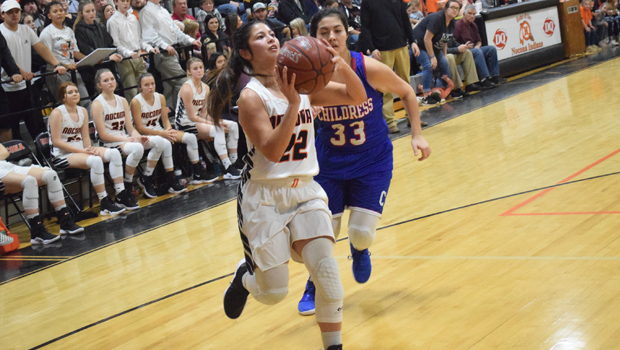 It was a memorable senior night for the Nocona Lady Indians on Friday as they avenged their only loss in district in dramatic fashion. Thanks to a desperation three-pointer at the buzzer from Averee Kleinhans, the Lady Indians avoided overtime as they beat Childress 43-40. With one game to go, the win puts Nocona in first place in the district. The Lady Indians knew they were in for a tough night when the Lady Cats tall post player Grace Foster scored 10 points both inside and out halfway through the first quarter as Childress led 10-3. Nocona got back into the game by pushing the ball in transition for scores at the basket from Kleinhans, but the Lady Cats led 12-10 heading into the second quarter. Childress was able to make a few three-pointers as they stayed a couple of scores ahead of the Lady Indians in the second quarter. Foster continued to walk her way into pull-up three-pointers and drives to the basket. Even with an extra defender coming in to help, she was able to score. A three-pointer at the buzzer from Foster put the Lady Cats up 28-23, with Foster scoring 20 of their points. Nocona needed to make some adjustments, but with no players as physically as imposing as her, Coach Kyle Spitzer knew it would take the team. The Lady Indians came out ready to play in the third quarter as Kleinhans scored five points to tie up the game in the first minute and half. Childress tried to take advantage of Foster’s size by trying to post her up, but Nocona’s Rachel Patrick was put on her to make her work. Patrick would front Foster in the post so that her teammates would have to throw the ball over her, but a second defender was ready to come over and double if they tried to make the pass. This seemed to crater the Lady Cats offense as no one else was able to get a good shot at the basket as they hesitated to risk a tough pass inside to Foster. Only once were they able to get her the ball and she scored while picking up a foul, making the free throw. It proved to be the only points of the quarter for Childress. Kleinhans continued to her scoring as she scored five more points while Brooke O’Neal added a running basket over Foster. The Lady Indians took the lead 35-31 heading into the fourth quarter with all the momentum. The fourth quarter was much slower paced than any of the quarters had been. Midway through the fourth, with Nocona up 38-33, the Lady Indians started to stall and run some clock. The Lady Cats were able to cut the lead to 40-38 with less than two minutes to go. Both teams missed several free throws before Childress tied the game with less than a minute to go and had a chance to take the lead twice, but air balled both shots. Nocona had the ball with five seconds left taking it out from underneath its basket. The ball made its way to Kleinhans hands who raced up the floor and veered a little to the right center just beyond the arc. With two defenders contesting, including the tall Foster, Kleinhans tried her best to draw contact to maybe get a foul call before releasing. No foul was called, but the ball went through the hoop as the buzzer sounded, giving the Lady Indians a 43-40 victory.